1. Prices have gone down, from shockingly overpriced to reasonably affordable (≈ 4-40€) (1, 2, 3). 2. Brightness. More higher lumen models (600-800 lm have been introduced, and even a few 1100+ lm), but most LEDs are still low-lumen (≈ 400 lm) – which make the least economic and environmental sense to replace and make dimmable. 3. Efficacy (lumen/watt) has improved (≈ 80 to 96 lm/w). (My comment: But as always, only if not including poor power factor and heat replacement effect in colder regions.) Both watts and efficacy were found to be overstated in many of the lamps tested, sometimes understated. 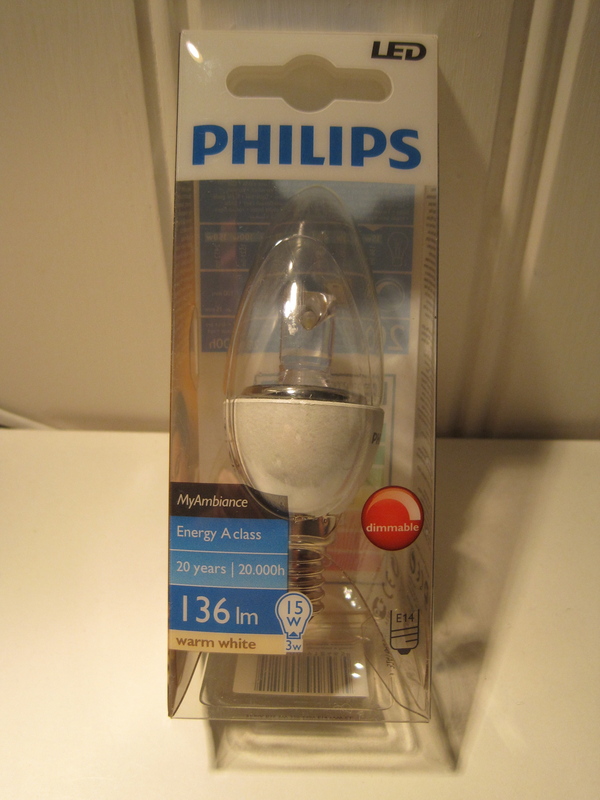 Usually just by a few per cent, but some lamps gave up to 39% less light than claimed on the box (1, 2, 3). 4. Colour rendering index has technically improved (CRI over 80 for most LEDs, a few even over 90). This, however, does not mean that the spectral power distribution is as even or full-spectrum as incandescent and sunlight, only that it has been tweaked to reproduce the required 8 colour samples more accurately when testing. 5. Light colour has improved for many warm-white LEDs. 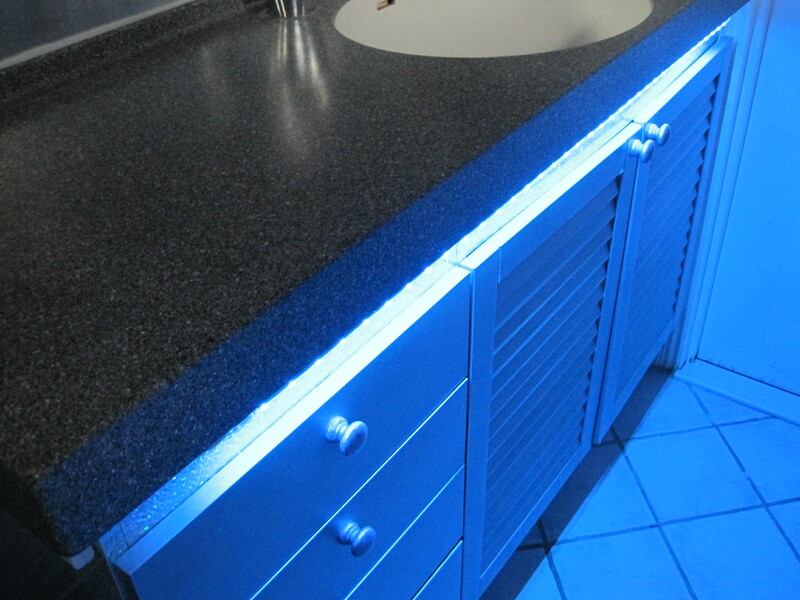 Only a few years ago most LEDs were a ghastly cool-white and the few marketed as “warm-white” could be anything from yellow, orange, greenish, blueish, or pinkish to a dull grey-white. Now, many LEDs have reached a similar decently warm-white emulation as CFLs finally did after 20 years, but the light colour may still vary between models and correlated colour temperature is often somewhat colder than the stated 2700K, according to the latest Swedish consumer tests (2, 3). 6. Colour consistency over time seems to have improved. A multilateral (pro-LED) European study found that only a few lamps exceeded the 6 MacAdam step tolerance limits after 100 and 1 000 h testing (1). 8. Dimmability. More LEDs are dimmable – but many are still not compatible with all dimmers, so read the specifications carefully. 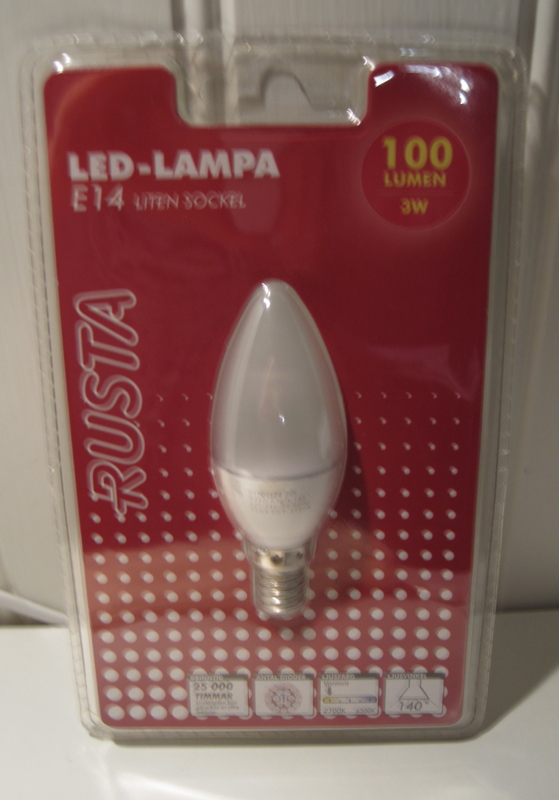 Some of the dimmable samples tested by Testfakta started humming, flickering or shut off completely when dimmed (2). The European study found similar problems (1). 10. Flicker can still be a problem in some lamps. Last summer Hillevi Hemphälä at the Lund Technical Institute started testing LEDs for flicker. She says it’s hard to for the consumer to know which lamps are good or not, as this is not always reflected in the price. There are LEDs powered by a pulsed current, which is a cheaper construction and facilitates dimming, but it can also increase subliminal flicker. “Problem med flimmer från LED-lampor” Final test results are yet to be published. Testfakta found the flicker index to vary between 0.01 (virtually no flicker) to 0.11 – but no correlation with the price (2). The multilateral European study said, “The flicker index and percent flicker of the lamps were measured and many lamps had no flicker” (1) – which is a roundabout way of saying that the rest of the lamps did have flicker. 11. Life span appears more reliable than for CFLs. LEDs don’t seem to be sensitive to rapid switching on/off, only to overheating which may make some LEDs expire prematurely. Swedish consumer test magazine Råd&Rön says all their earlier tested LEDs have lasted longer than 5 000 hours so they discontinued durability tests for LEDs, as the models involved would be replaced in the market by the time the long-term test was done (3). 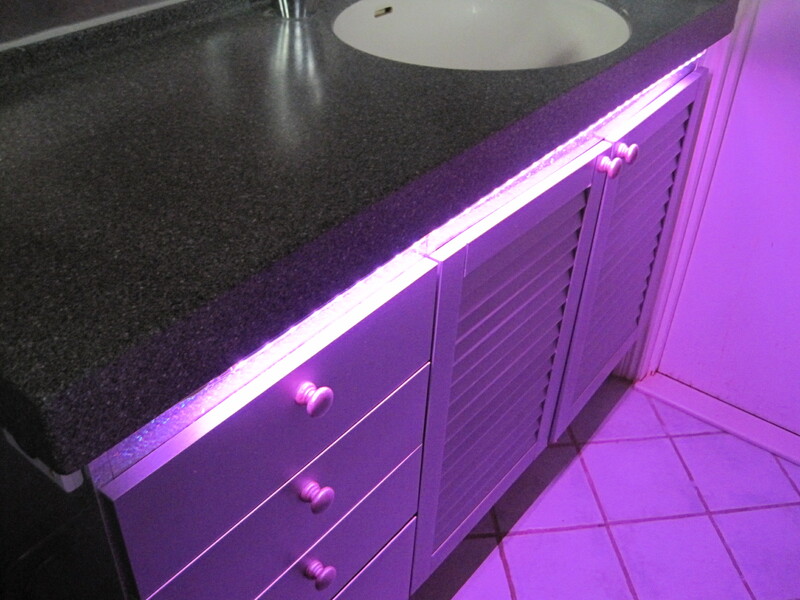 In the European study, a few LEDs were non-functional right out of the box (). 12. Light distribution has improved. Spreading the light equally in all directions has been a challenge as diodes are naturally directional with quite a narrow beam angle. To get around that problem, diodes were first just placed around a central stick – with mediocre results. Some brands have now solved this by adding a diffusing lens over a single power-LED die – which also markedly increases the price but gives a light distribution more like that of a traditional bulb (though never with the same sparkling clarity, sunny feeling, or beautiful glow, of course). I tested a filament LED with CRI 90 (= improved colour rendition) from Star Trading. For me it was still not close enough to want to replace a real incandescent bulb in my living room, but OK for outdoors. Others might find it acceptable. 14. Temperature-tolerance. 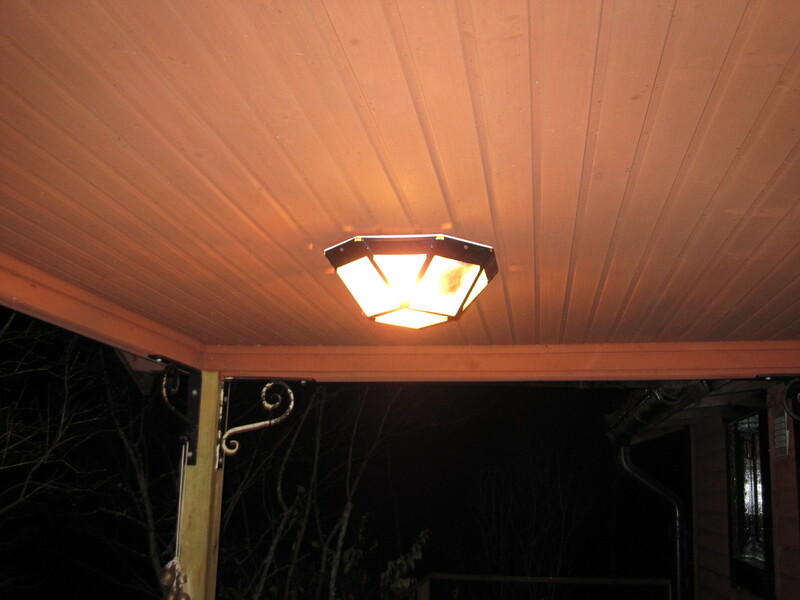 LED lamps are ideal for outdoors, even in the winter, as they are not sensitive to cold like CFLs (which can take forever to light up in cold temperatures). 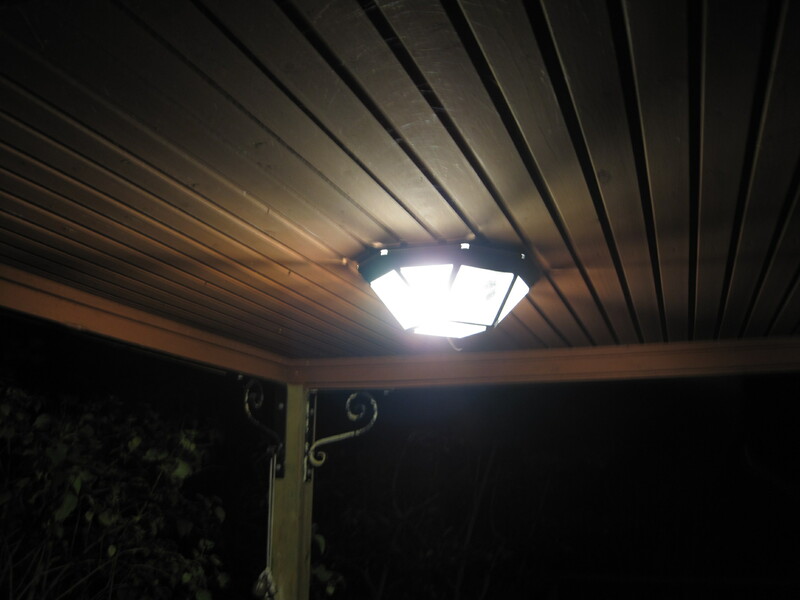 Outdoor lamps are also the most worthwhile replacing if left on for many hours per day, or night. 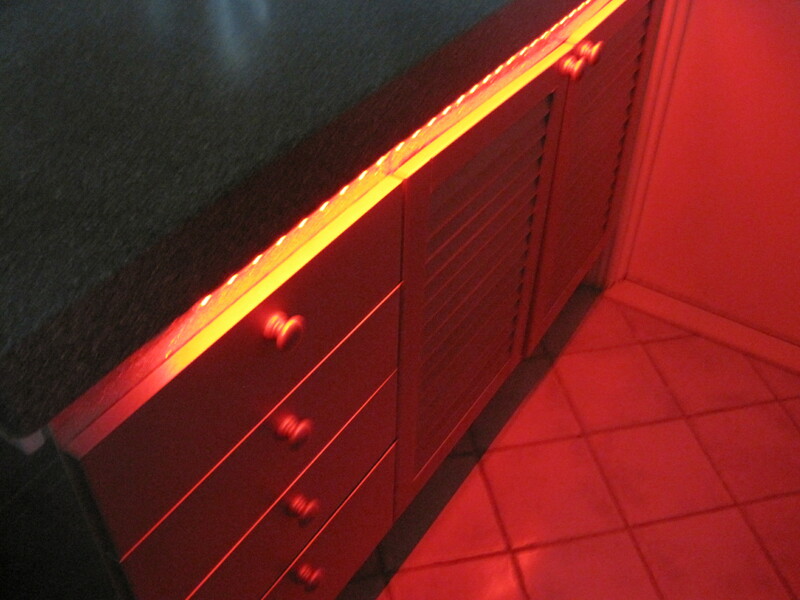 However, LEDs are still sensitive to heat and cannot be used for example in a sauna. 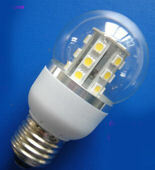 Only incandescent/halogen lamps tolerate heat well. 16. LED li-fi. LED lamps can now be used for delivering ultra fast wi-fi. Considering how many have experienced severe symptoms from smart meters, does this sound like a good idea? 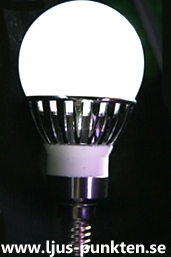 Unfortunately, this also means increased support for LED lighting, despite the high price, mediocre light quality, technical safety issues, mediocre power factor, glare and blue light hazard to eyes, using up more resources to manufacture, and containing rare earth phosphors which cause much destruction to the environment in mining areas. 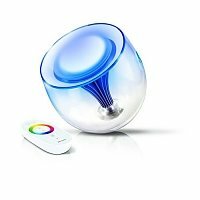 This new Philips RGB bulb can be set to almost any colour, just like other RGB lamps. But instead of a separate remote control, this one is controlled by an iPhone or iPad app, wich makes it a lot more flexible. Specs given are: 8.5 watts, 600 lumens (equivalent of 50 watt incandescent) and not compatible with existing dimmers – although it seems that lamp brightness can be controlled via the app. The Apple store website has more reviews. I’m glad to see new creative ideas being applied to LED technology, making use of what it does best: create coloured light, instead of trying to imitate incandescent lamps – which any non-incandescent light technology is predestined to fail at since you cannot reproduce the quality (glow, feel and colour rendition) of fire-based light without it containing the element of fire. But very cool that light temperature can be set (and pre-set) to perfectly suit one’s mood and various activity levels during the day. How precisely that works in real life, and how well those settings reproduce existing colours, I’d like to see for myself, but I like the idea so far. EDIT: Oh, now I saw that this “smart-lamp” was already invented by LIFX and launched in September. The presentation on kickstarter.com and the video on LIFX website shows the exact same features but also working with Android. Seems Philips ripped off the idea and made it an Apple exclusive. That’s not very creative. Info: 6W, 90 lumen, 20 000 hour life rate. Strips join together into either one long strip or at angles, e.g. around a small mirror. Colour: All colours, easily picked with control panel. Can be set to monochrome, alternating or fading seamlessly through the spectrum. Impression: Great product! Very flexible design. More decorative than for illumination but it worked perfectly for the purpose I bought it for, which was to give a soft coloured light from under the basin cabinet while brushing teeth at night (as my bathroom lamps are not dimmable and I can’t stand bright light right into my eyes just before bedtime). 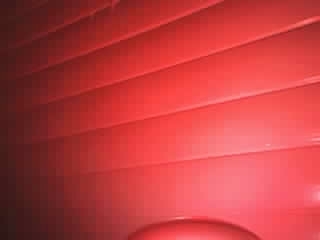 So then I use the red setting, which is the darkest and the least melatonin-suppressing. When I have guests or just want a change, I can use other colours and make my bathroom look really festive and colourful with just a click on the control panel. Love it! Unlike the gloomy excuses for ‘warm-white’ LEDs at IKEA, the varying colours on this one really cheers one up! If I had kids, I’d make a magic room for them with several of these. Info: 3W, E14 socket, clear, 136 lumen, 20 000 hour life rate. Colour: 2700 Kelvin, decently warm-white. 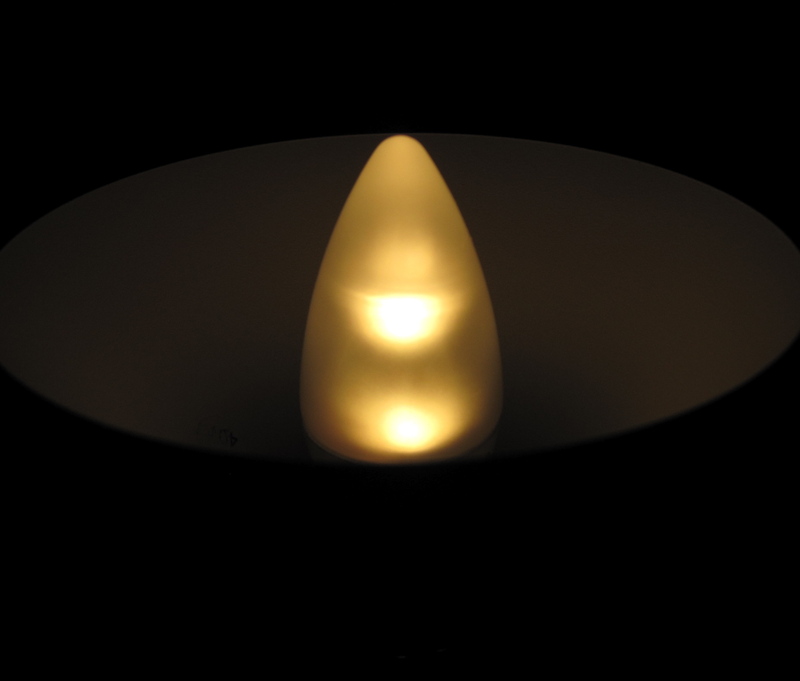 Impression: A similar design as the semi-opaque candle LED but clear. This one too looked nice enough in the shop that I had to try it at home. But alas, same thing again… Decorative design and decent light colour but the reflected light was just dull and gloomy, compared to the brilliant sunny warmth of incandescent light. And I’m not trying to find fault with LEDs here. Quite the contrary. If someone could produce an LED that gave as nice a light as incandescent lamps, I’d be happy to give my incandescent advocacy a rest and leave well enough alone. But it’s not good enough. At IKEAs the other week, a whole section of their lamp department was lit by LED lamps only, and the effect was sadly gloomy too. I can not imagine a future with only such poorer quality light available. I’m starting to get really tired of all these LED articles and press-releases now replacing the over-optimistic CFL -pushing articles in the news stream, so sorry for starting out a bit grouchy. But I’ll report them anway. In his dreams maybe. And our nightmare. IKEA is setting out to change the way you light your home, one bulb at a time. The Swedish retailer announced plans this week to become the first U.S. home furnishings chain to sell only LED (light emitting diode) bulbs and lamps by 2016 — a bold push for the widespread adoption of this energy-efficient light source in the American market. The world’s biggest home retailer will phase out its non-LED lighting over the next few years. Which is none of its business! What happened to consumer choice?? I’m not sure if any promises were made to consumers by the U.S. Government, but the European Commission has promised continued availability of halogen lamps until 2016, so I don’t see how IKEA has a right to make them unavailable. But as the profit margin is now bigger for LEDs than for CFLs and halogen lamps, the decision makes perfect sense. IKEA has had nearly two decades to make huge profits on really crappy CFLs, and now they want to make even greater profits on to pushing crappy LEDs instead and removing all competing products. Smart, from a business point of view, but not a consumer-friendly decision. As explained in previous posts, there are for example elderly and vision impaired who only see well in incandescent/halogen light. With LEDs there are dimming problems, higher price, poorer colour rendition and you get a gloomier ambiance in your home. Integral to that plan is educating the U.S. consumer about the many benefits of LED lighting: LEDs are not only more eco-friendly than incandescent bulbs, but also use 85% less energy and are therefore less expensive over time, Mike Ward, president of IKEA USA, told DailyFinance. Sigh… here we go again. For LEDs to use 85% less energy, they would have to produce about 100 lumen per watt. Even the best LEDs on the market don’t do that, and I very much doubt IKEAs LEDs counts among those, either in quality or quantity. But selling the idea won’t be a slam dunk, as the initial cost outlay for LED bulbs far exceeds that of incandescent bulbs, Ward concedes. A 40-watt LED bulb costs about $12 at IKEA, whereas an incandescent bulb ranges from approximately 49 cents to 79 cents. But what most Americans (about 73%) don’t know is that LED bulbs last 20 years, according to Wakefield Research cited by IKEA. Incandescent bulbs, by contrast, last only about a year, Ward said. Oh, I think they do know this since it’s being repeated with the same fervor as the earlier CFL PR slogans (which turned out to be totally false in real life). What consumers may not know, however, is that theirLED light will continue to get weaker and weaker with age, and be useless for illumination long before those 20 years are up. In which time much better lamps will probably have been invented and then you’re stuck with an outdated and increasingly poorly performing lamp for a decade or more. These new X-tremeVision LED bulbs are available in two light color temperatures: 4,000 K and 6,000 K. The 4,000 K white light is much closer to daylight than a traditional incandescent interior bulb. The 6,000 K version takes it up a notch and delivers the bright white look of Xenon HID, yet consumes 13 times less energy, according to Philips. Grrr. Why would anyone want daylight at night? That is totally unnatural. And trying to emulate Xenon HID is an extremely bad idea since they are the worst headlight lamps ever invented. See also my post Blue light hazard? for how blue light is more glaring and blinding than warmer colour temperatures, which is not exactly helpful in traffic! Extreme light is not what you want to meet on the road when driving at night. Is this a sort of empathy thing? Where the driver is meant to care only about his/her own visibility even if it blinds and endangers meeting traffic? The Dutch Lemnis Lighting which started selling a joint lamp for $ 4.95. The goal is to attract consumers who are hesitating to buy led lamps as the price so far has been high, often several hundred pieces. The lamp is relatively simple and can not be dimmed. It delivers 200 lumens, much like a 25 watt bulb, but the effect is only 5 watts. Color temperature is 2700, which gives a warm white light. Colour rendering index, CRI, is 85, and life is said to be 15,000 hours. So far the lamp only on sale in Lemnis American online store that caters to clients in USA, Mexico and Canada. 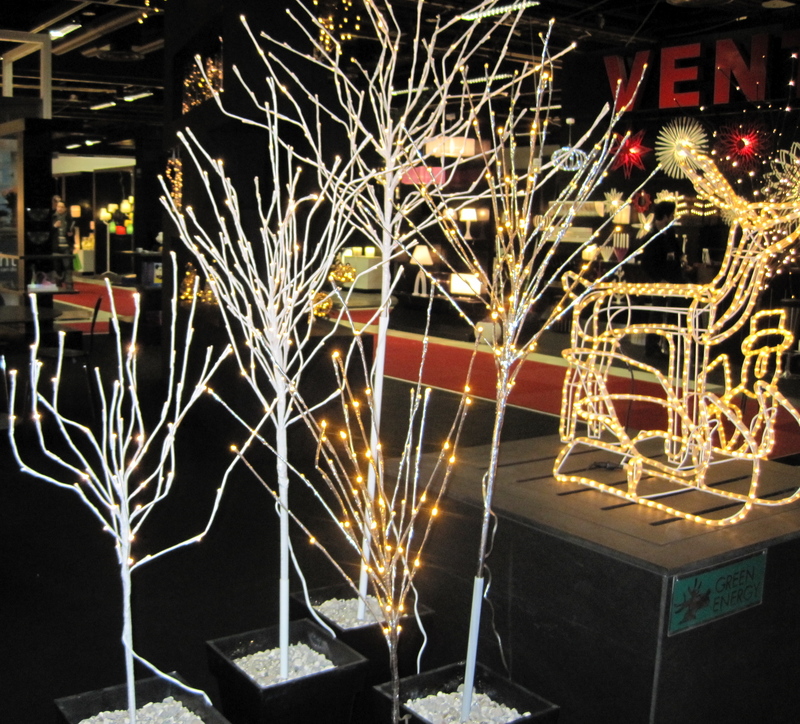 Lemnis Lighting has by his own admission has sold more than 5 million LED lights since 2006. When New Technologies in June 2010 tested LED lights representing 40 watt bulbs so got Lemnis candidate best results of the three tested. 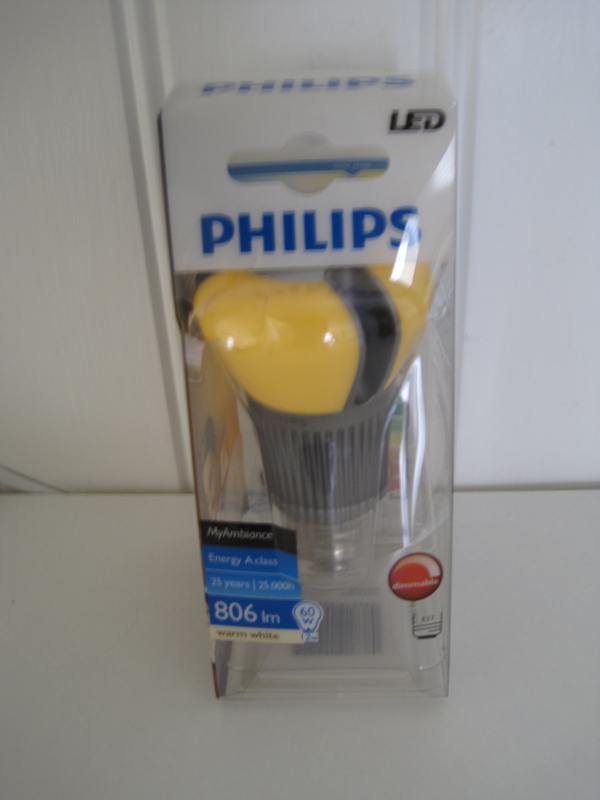 One of the founders is also Warner Philips, the great grandson of the founder of lighting giant Philips. Clearly not in Europe though. Skipping the dimmability I think is a good idea since they don’t dim nicely anyway. I would still not pay even $5 for a 200 lumen LED, but for those who don’t mind the lower light quality it’s good they are making an effort to bring prices down. 3M has developed a LED lamp that is unlike any other. While other lamp manufacturers put the diodes in the bulb and the driver electronics in the socket 3M does the opposite. In a ring in the socket, ten diodes are placed that send the light straight up. The light passes along the contour of the globe, thanks to a waveguide spreading the light over the entire surface to radiate in all directions. Everything to mimic the light from a frosted lightbulb. The driver electronics are inside the bulb, a slick solution because it is more spacious and airy there, compared to the socket where the electronics usually sit. Many LEDs therefore have bulky heatsinks to prevent the diods from getting too hot and lose both intensity and longevity. 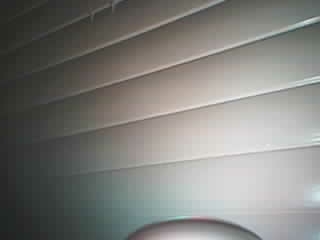 In the 3M narrow slits in the bulb helps ventilate the heat. 3M launches two wattages. One of 13.5 watts which provides 800 lumens and can replace a 60 watt incandescent bulb. The second is at 8.5 watts and provides 450 lumens, equivalent to a 40 watt bulb. Both are available in two versions for warm white and cold light. Life rate is said to be 25 years if you use the lamp three hours a day on average. The new lights will be on sale in Walmart stores across the U.S. this fall. The price of the 13.5 watt lamp is as reported in the American press to be 25 US dollars. This week I bought two LED lamps. I picked the ones that looked best in each store, to see how they would look in a home environment. Info: 12W (12.5 really, but it’s marked 12W), E27 socket, 806 lumen (about 200 lumen more than most 60 W-replacement CFLs! ), dimmable, 25 000 hour life rate, “Made in China”. Colour: 2700 Kelvin, and truly warm-white. Brightest LED for home use that I’ve seen so far. Even quite glaring, so best used with a lamp shade. While it looks very incandescent-like when you look at the lamp itself, the light from it is visibly not quite the same quality as that from incandescent lamps. Comparing it with the crystal clear halogen light it renders colours somewhat greyer. And when using it as the only light in the room, the whole ambiance turns a bit gloomy and dull, though more subtly so than lower quality LEDs and CFLs. And still the best I’ve seen so far. Edit: It also got very hot after I’d left it in for a while and tried to remove it again. Not as burning hot as a halogen lamp of course, but still enough to require gloves or leaving it to cool for a while. I think I’ll use it as replacement for my 53W halogen porch lamp. Then I can leave it on when leaving home during the dark season. Update: This is how it looked when I put it in. Good enough for outdoors, but the light is not quite as clear as that from the halogen lamp, and still has that ever-so-slight pink-white tint of all phosphor-coated light sources, though too subtle to catch on camera. Update 9 Oct: I could no longer stand the unnatural fluorescent-looking pinkish light, so today this expensive LED got switched to one of the 60W carbon filament incandescents I’ve hoarded and now my porch looks nice and cosy again. 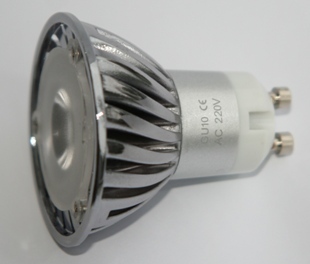 Info: 3W, E14 socket, 1-diod, 100 lumen, 140 degree beam angle, non-dimmable, 25 000 hour life rate. Colour: 2700 K and fairly warm-white. Impression: This one caught my eye in the store as the lit demonstration lamp looked different than other LEDs I’ve seen in that it was somewhere inbetween clear and frosted, with a thick, semi-transparent, very cleverly designed inner glass that focuses the light and makes it look almost like a decent bright point replacement for a chandelier incandescent candle lamp. However, it disappointingly looked better in the shop (and in the above picture) than in real life at home. Light colour not quite as warm as such a low-watt lamp should be, more pinkish-white than in my photo. It also had a duller light and created a gloomier ambiance than my original incandescent lamp. Funny thing happened when I put it in… As I held it by the painted metal base, it started glowing faintly blue at skin contact, even though the light switch for that particular luminaire was turned off. I think this will be all for a while. If these are the best lamps I could find on the household market today, I see no use in reviewing any of the lamps that looked inferior already in the store. After seeing it on the Northern Light Fair I wanted to test one of Lampkonsulenten‘s floor reflector luminaires with warm-white high-quality LED in a home setting, as a reading/bed light. Info: Price around €150. Expected lamp life around 50 000 hrs. 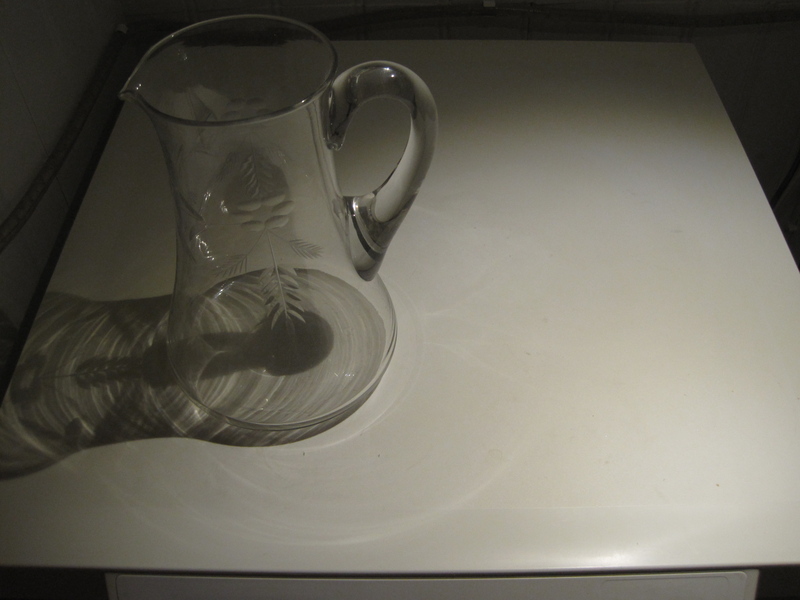 Impression: Compared with an equivalent halogen floor spot of similar model, it actually lit up the pages of a book better and enhanced the contrast. LED light is very directional and this was no exception so it really focused all light on the book. However, when trying it for mood lighting it did not sparkle and spread the light around the room like the halogen lamp; the light sort of faded mid-air. When used as sole illumination, it made the room look a bit cool, dead and gloomy. 1. A bit of incandescent/halogen light is clearly needed in order to create a warm and alive feel to the room. 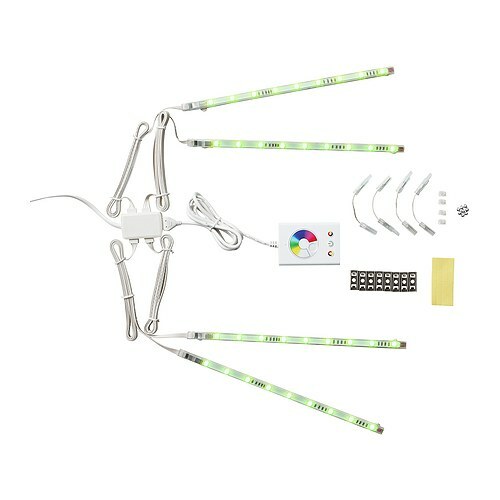 LEDs should thus be used as complementary light for specific tasks, or for decoration, not as primary light source. 2. LED is by nature a directional light source and should be used as such. Trying to get it to spread light in all directions like a standard bulb will just scatter the light so that the bulb illuminates little more than itself. 3. LED light is best utilised at fairly close range when using it for illumination. 4. Warm-white LEDs may need to have an even lower correlated colour temperature than incandescent lamps in order to appear as warm. 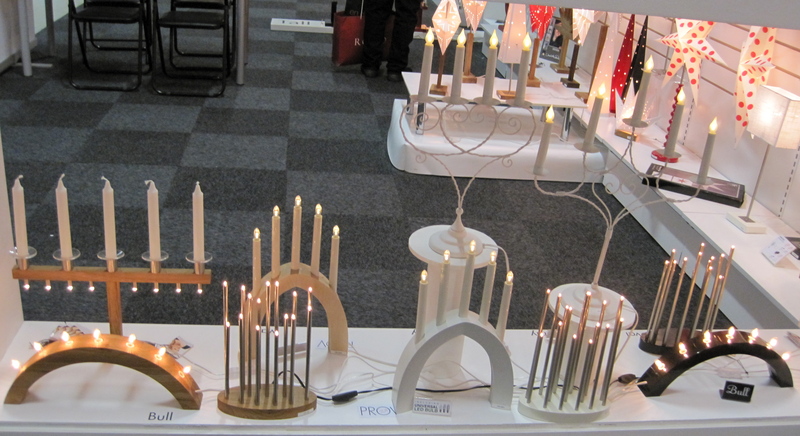 Yesterday I was at the Northern Light Fair in Stockholm to check out the latest lamps. I have to say I was pleasantly surprised by most CFLs displayed. Both Osram, Megaman and italian Leuci had CFLs in good incandescent-like colour, looking decently bright too. One of Osram’s displays. The lamps left and middle are CFLs, and the 5 to the right are decorative incandescent (which looked brighter in real life). While the LEDs certainly have improved since my last visit to the Light Fair two years ago, there are still huge quality differences between different types of LEDs. First I checked out the holiday lights; strings, icicles, candelabras etc. As usual, coloured ones were great, the cool-white horrid, and the warm-white ones of varying quality. Some were pink-white, others ugly yellow, but a few were actually very incandescent-looking, so clearly they are improving. However, only in light colour, not in light output. In this picture the difference between the somewhat pale LEDs (to the left) and the glowing traditional incandescent strings (to the right) is clearly visible, even though it is clearer in real life. Strings with many little light points still work as decorative lights, but in the candelabras there wasn’t enough light to radiate outwards, just a dull and gloomy glow inside the little bulbs, clearly not nearly as bright as the incandescent candelabra next to it and not at all giving that warm Christmas feel that you want from an electric candelabra. 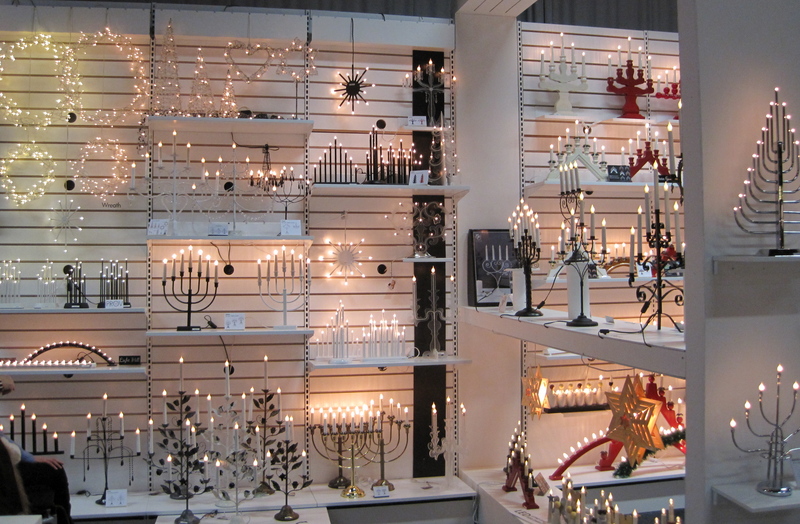 In this picture the real incandescent candelabra is the glowing one in the lower left corner. The duller ones that don’t radiate are LED. Next, I looked at non-decorative LEDs. Again I found great quality variations in the various attempts at producing bright warm-white light. 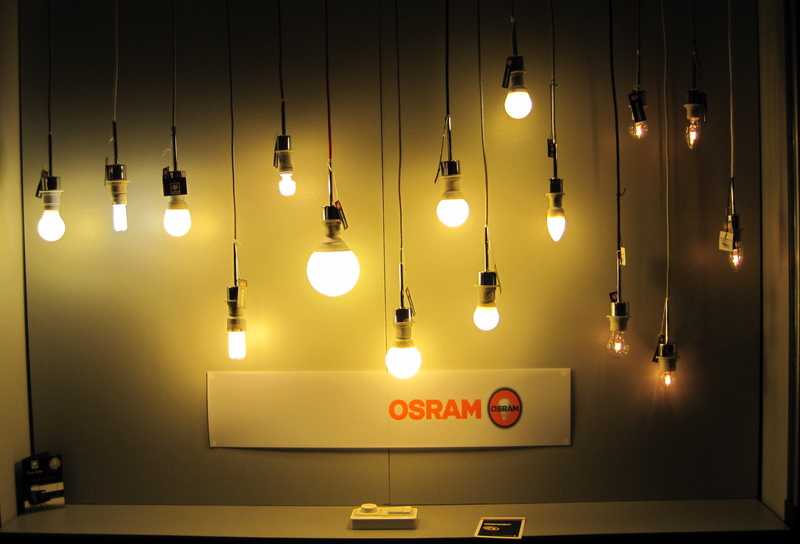 I was not impressed with any of the LED retrofit bulbs from Osram, Megaman and Leuci. Bleak light, colour not quite right, still insisting on the less-than-great idea of putting LEDs in a retrofit bulb etc. 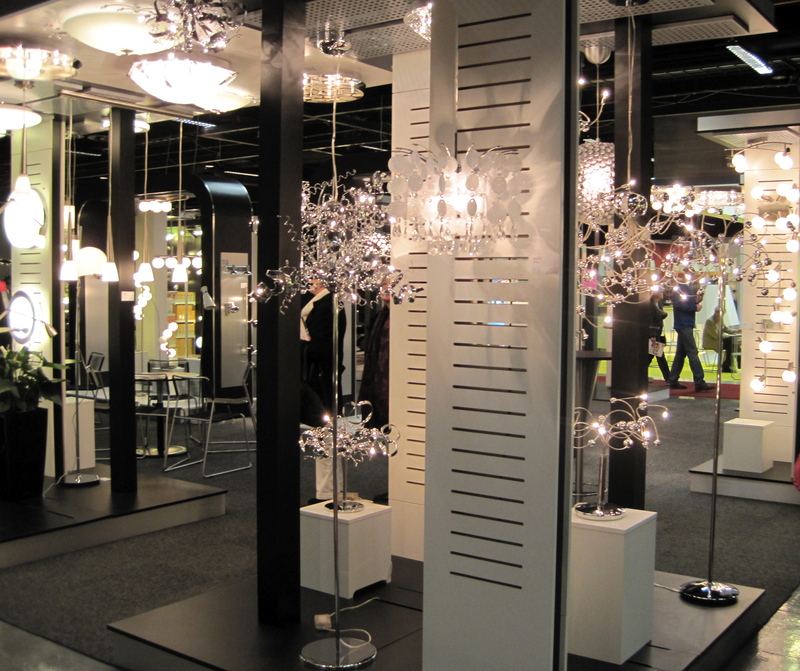 The best LEDs came integrated in luminaires from Norwegian luminaire company Lampkonsulenten. Their high power LEDs were of a completely different quality class and came in white and warm-white light which both looked decently incandescent-like and decently bright and radiating (as far as I was able to tell in this well-lit commercial setting; I’d have to try one at home to see if this impression holds). Compared to these quality LEDs, all others on the fair looked like a joke. But it made me a bit more optimistic regarding the options available for professional lighting designers even if their output is still limited and the quality not quite as high as real incandescent light. But I think they would do well compared with metal halide for example, at least quality-wise. Both Osram and Leuci had excellent halogen energy savers. The Osram representative said it is technically possible to make halogen lamps much more effective even without the integrated low-voltage transformer (which Philips use for their B-class halogen lamps) but it requires more R&D so they want to be sure there is enough market for it before investing and didn’t seem in a hurry to do so before EU bans C-class lamps in 2016. So do let them know if you’re interested in even more effective halogen lamps now! If you like real incandescent light, this is the replacement to go for. On the luminaire side, I found a great variety and much creativity. General trend seems to be softer shapes compared to the cold, hard designs that totally dominated the market just a couple of years ago, fewer black lamp shades (finally!) and much playfulness, e.g. integrating decorative LEDs in the design, using new materials in creative combinations, and making crystal chandeliers that truly look like something from this century. Info: 20-diode spotlight. Price was decent for an LED, just over 6€. Impression: Don’t quite know what to make of this one. On the one hand it’s impressive to get so much light – at least in one direction – out of what is only 1.2 watts! I picked this particular lamp because the light looked more white than the markedly green-white or blue-white I’d seen previously. It seems to have decent colour rendering too, both to the naked eye and in my DVD-test where I could see the full spectrum reflected without any large visible gaps. 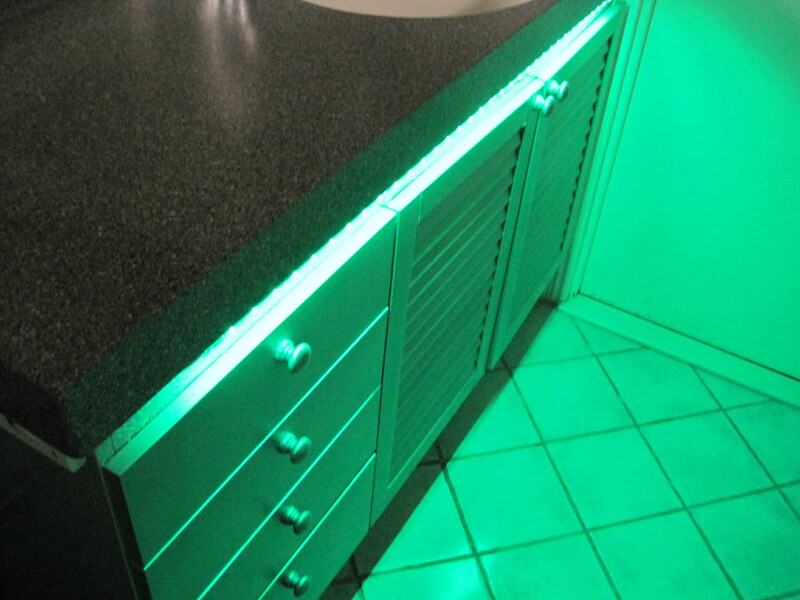 Colour: Still slightly green-white (which is not surprising as ‘warm-white’ LEDs usually consist of blue diodes with yellow filters). Some may like this slightly cooler light (around 3000K, but gets a little warmer over time) but for my personal taste it still looks too much like FL light and gives my kitchen an industrial feel which does not complement the warm colours and traditional design in a good way. It did however, throw the light down onto my freezer in a very distinct way. I have to say I was disappointed as I prefer mercury-free LED before CFL and would love to find a good enough LED to recommend instead. For commercial purposes fine, but not for home lighting unless that industrial feel is what you prefer. I’ll keep looking. Impression: This lamp is a joke. It’s not even remotely warm-white, it’s cool-white like a moon-beam, and about as dim. It gives only 65 lumen, less than a 10W incandescent, which is good for absolutely nothing. You certainly can’t read in it and it’s not warm enough to be used as mood-lighting (except at a Halloween party perahps). And this was the brightest LED globe light I could find in Stockholm retail stores! Looking at the small print on the back of the package it says this lamp type is recommended “for decoration” or “for dark spaces like the cellar stairs, the attic passage-way, the garage or storage area”. But it is not decorative, just dim and generally gloomy, now why would anyone want to put such a light in their cellar stairs and risk breaking their neck, or in spaces that are usually already creepy enough without adding a dim ghost light to it? Info: Price around 19€. Rated life 50 000 hours. 350 lumen or “about as much light as a 40W incandescent but using 1/10th the energy”. Will not get warm, light up 100% in half a second. Impression: Yes, like all LEDs it lights up instantly and is luke-warm enough to touch even after being on for a while. Colour: Warm-pink-white that looks similar to ‘warm-white’ fluorescent light rather than to golden-white incandescent light. Brightness: Nowhere near that of a 40W incandescent. The 350 lm may be correct but a 40W incandescent gives 410-505 lumen and visual comparison between an incandescent 40W lamp seems to confirm it, so this seems to be another case of consumer fraud. 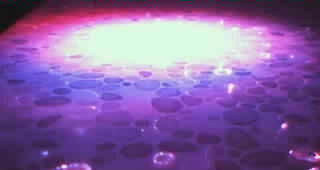 At the same time it is too glaring to the naked eye and must be used in a lamp with a thick shade so that the glaring little dots don’t shine through. Which reduces its brightness even more as it is designed to throw light to the sides rather than downwards. Tried it in different luminaires. In modern table- & floor luminaires it doesn’t work very well: what little light that finds its way out of the shade is very dim and gloomy indeed, and of no use whatsoever. A classic architect luminaire seems to be the only one it works with. The wide shade spreads the light much better than the very directional GU10 spotlight. In this luminaire it works for reading if you can ignore the faint light dots reflected on the page. Light quality: Like the other LEDs, the spectrum of this one is continuous in the warm end of the spectrum but spiky in the blue end. Colour in the room look sort of dampend, as if seen through a grey filter. Whatever room I try it in, it turns all gloomy and depressing. No life. Info: Price around 24€. 120 lumen or equivalent of a 25W incandescent. 50 000 hr life. Ceramic foot and chromed aluminium house. Impression: The frosted glass makes this one easier on the eyes and works well enough to read in. The socket limits its usefulness as its long heat sink makes it stick out too far in all the various E14 reflector luminaires I have. Putting it in a luminaire with a shade will reduce light output too much. 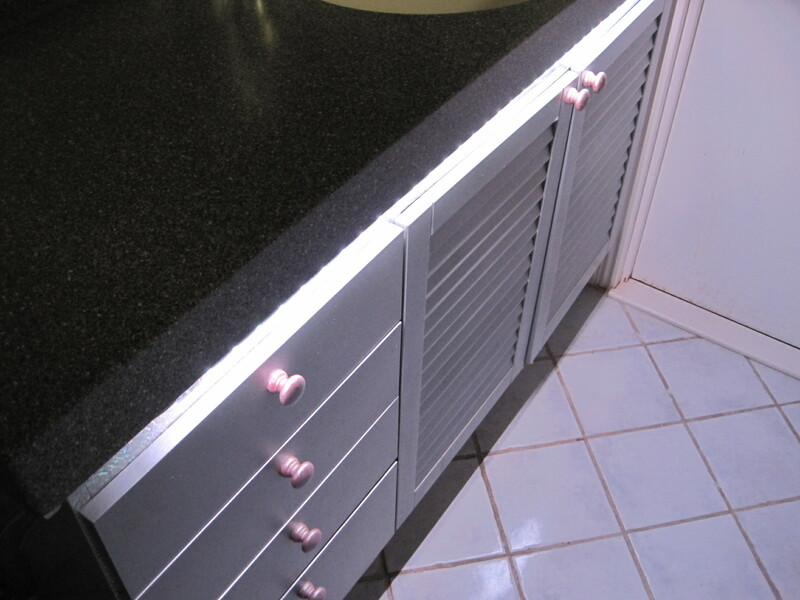 The best fit would probably be in a vanity light for those who want a non-glaring white. Colour: Cool-pink-white. More like fluorescent light and even less incandescent-like than the Osram CFL tested above. Brightness: Again erroneous equivalence info. An 25W incandescent lamp gives 215-235 lm so a 120 lm should not be enough to replace it. 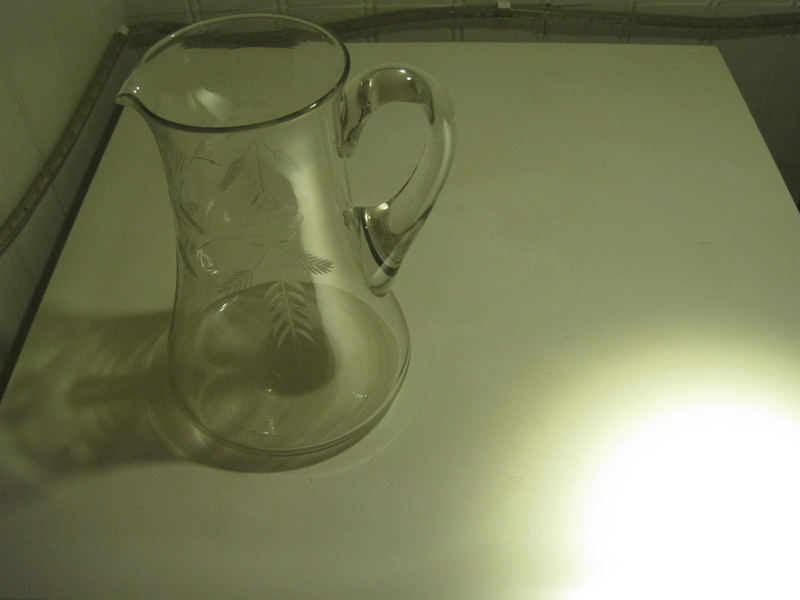 However, this one actually seems even brighter than a 25W incandescent, though the light itself has a duller quality. Light quality: Continuous spectrum but with green, violet and magenta missing. Colours in the room tend to look a bit grey and faded and white surfaces look distinctly cool-pink, even though the bulb itself looks more neutral-white. No picture but it looks like a normal size version of the mini globe above (= diodes on a stick stuck in a clear bulb). Info: Price around 16€. For in- and outdoor use. 25 years claimed life. Impression: Another useless LED. Very dim light, good for nothing. What Osram calls ‘warm-white’ is green-white. Even putting a peach shade on it does not remove the green tint. Not pleasant or attractive! Complete waste of money if you ask me. I hope we don’t have to wait another two decades before Osram gets their WLED phosphor mix right. Info: Price around 23€. 1-point spotlight with 60 degree beam angle. Impression: Fairly bright for only 3 watts. This one had a dull-white light somewhere inbetween warm and cool. Not nearly good enough to replace my top quality GU10 halogen spot. Everything seems to be about holiday lights now, with new LED light strings using a fraction of the usual energy, with almost no fire risk if installed correctly. Do I recommend them? Yes and no. Depends on colour. Coloured – yes! No reason whatsoever not to switch to LED. Warm-white – maybe. It depends on how keen you are on getting an exact incandescent replacement. If you are, there aren’t any. What is sold as “warm-white” tends to be either pink-white, yellow-white or greenish-yellow. How much they’re off from the brilliant golden-white of incandescent lights varies between models and brands. Some are close enough to be acceptable. Make sure to look and compare before you buy. Maybe you don’t care as long as there is light? Then by all means, do buy them! Being left on perhaps all night and even all day for a whole month or two, it can be well worth the investment. Just get ones that look good enough for your standards. Here are some tips from Gadget Guy on how to calculate savings: What Holiday Lights Are Best? Here I’ll be reviewing coloured LED lamps. Info: Plugs right into the electric socket and has a little button at the bulb base: each new click gives light blue, hot pink, cool green, soft orange, bright blue,alternating and no light. Also has a light sensor and turns itself off in the daytime or when ambient light is bright enough. Rather sophisticated for being the size of a golf-ball and will probably last ‘forever’. Price about 15€. Impression: Love this one! LED technology used for what it does best: produce coloured decorative/lead light at extremely low wattage and heat loss. Is hardly even warm when you touch it. Great for kids! Info: Remote-controlled LED retrofit lamp that can replace a standard bulb. Light output 140 lumen. Price about 36€ (incl shipping). Impression: I wanted to know a) if I could get a more natural looking warm-white by tuning it myself and b) if I’d be able to create any shade imaginable. The answer to both is “no”. a) The white is nowhere near white, but a visible mix of different colours. b) The 16 colours are pre-set and cannot be adjusted manually as I had mistakenly assumed. A home spectral test with a DVD shows the blue–green part of the spectrum very clearly, then a dip in the yellow–orange area, then a nice bright red and no magenta. Lighting food and clothes with it made red bell peppers and a blue robe look almost fluorescent. But what did I think of it otherwise? Well, the truth is that I love it anyway! What is probably an unintentional design flaw – that in mixed colours it shows the mixing colours separated into concentric rings instead of being displayed as a smooth blend – actually makes its light beam uniquely special, intriguing and pretty, as long as one does not need a white light to see well in. It’s purely decorative, but very much so! 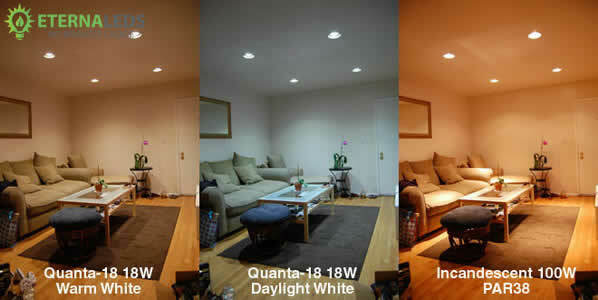 Info: Remote-controlled indirect floodlight that puts colour on a white wall. It does what I thought the simple RGB lamp would do: with the remote control it is possible to choose any hue by scrolling on the colour circle, and fine-tune both colour saturation (from deep to pastel) and light intensity (from bright to dim) to the desired shade. Price about 150€. Also comes in a mini-model for around 100€. Impression: I’m fairly impressed with this one. Very cool futuristic design: a decorative object in itself. Almost the size of a soccer-ball (though more resembling a small gold-fish bowl with a goth vase in it). Nicely designed and easy-to-use remote as well. Great light for mood & decorative purposes. Not sure about the “16 million colours” – that’s probably more theoretical than practically achievable – but it seems to have enough versatility to let one create one’s favorite hue and shade fairly exactly. Except a good white, just various pastel tints (which are nice in themselves, though not perfectly white). I’ll give it 4½ lightbulbs out of 5. One of the most fun and versatile lighting products I’ve ever seen! I especially like the possibility of creating pastels, as they make the room brighter and create a softer and more sophisticated lightscape. I’m finding that I can easily change it to match the dawn outside my window as it gets brighter and sunnier. Update 1 Aug: After using it as general lighting in my home office for a couple of days instead of my halogen two-way desk-light, I find that it has an odd side-effect on my vision. Directly after using it and turning it off, all natural light looks strange and ‘fluorescent-like’ for a while until my eyes have readjusted to normal lighting. I’ve noticed this with the other RGB LED as well. This does not happen even after a whole day staring at my CRT screen. Update 4 Aug: I first thought the explanation might be the odd spectral distribution unique to LED in general, but it’s probably as simple as the light in the RGB LEDs being coloured and hyperstimulating the cones. After using the warm-white GU10 LED spotlight as desk lighting for a day, I do not get this effect.